Each month they ship gourmet food items in their signature wooden crate. The Products: Artisan foods for the modern man’s pantry. Each box comes with a fold out card detailing the producers behind the food included and where in the country they’re based. This box also includes a note from Mantry’s curator. Lassi is a blended, yogurt-based drink that’s popular in the Punjab region of northern India. It’s typically a little sweet and a little salty, which makes it a great inspiration for salt water taffy! The flavor of this taffy is creamy, fruity, and salty. I like it a lot. Masala Pop makes air-popped popcorn in a variety of Indian-inspired flavors. The Savory Masala with Papadums flavor is really tasty- and really spicy! I’ve tried Lawless Jerky before, and I like that the Lawless range includes lots of creative flavors like Japanese Curry, Mango Habanero, and Sweet Sriracha. Pho, a Vietnamese noodle dish, is the inspiration for this flavor. It’s made with cilantro, mint, basil, star anise, cinnamon, cloves, and jalapeno. Sriracha is one of my favorite condiments. I love adding it to eggs, sandwiches, soups, and chili, and I think this is a really creative take on the original. I wasn’t sure how well maple would pair with sriracha, but I’m a fan. Mantry suggests using it as a glaze for chicken satay, which sounds fantastic! This Balsamic Nectar is made is Colorado and can be used on meats, bruschetta, vegetables, or as a salad dressing. It’s sweet and tangy, and I think it will be great drizzled over bruschetta. On Mantry’s website, they’re provided a recipe for Bruschetta with Balsamic Nectar, and I can’t wait to give it a try. These almonds are roasted with ginger, lemon, and Herbes de Provence. Clif Family specializes in wine making, and they recommend pairing them with Chardonnay. I haven’t had the chance to try them with wine, but I can attest to the fact that they’re fantastic on their own! Verdict: Mantry always does a great job of introducing me to delicious products from small producers around the country. They’re fantastic at curating boxes around a theme, and I’m always excited to see what theme they’ll come up with next! This month, my favorite items were the balsamic nectar and salt water taffy. Usually, I like to test out the recipes that Mantry posts on their website, but this box arrived a bit later than usual, so I decided to skip them this month. In terms of value, the items in this month’s box total just over $60, which is at the top end of the value range I’ve come to expect from Mantry. 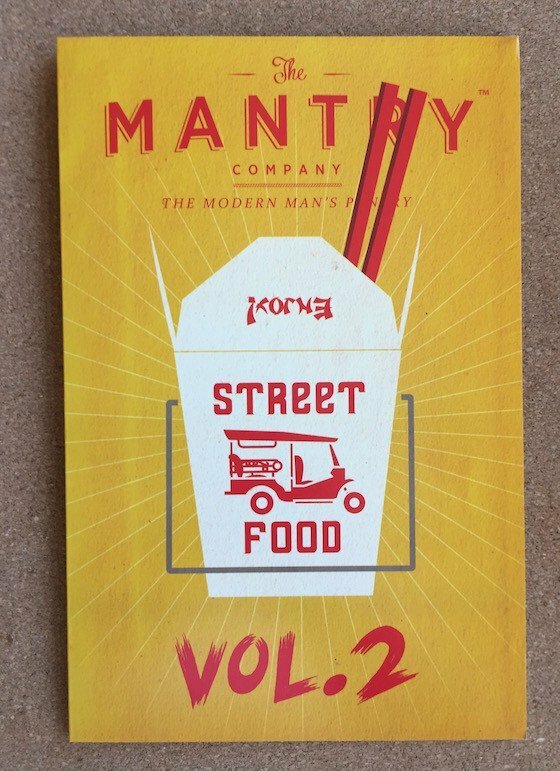 What do you think of Mantry’s Street Food Vol. 2 Box? Have you tried any of the items featured in this box? Hi- Thanks for the review. Do you know if Mantry does a discount code with their subscription? If you like the Balsamic Nectar, check out pastamore.com. I lived in CO for a few years and they were local to me and I still buy from them online. The white balsamic pear is AMAZING on vanilla ice cream!